I recently bought volume 8 of the Ponies of Britain magazine, for Autumn 1970, as part of my continuing researches into pony book authors and illustrators. Every time I read the old Pony Magazines I've acquired from the 1960s and 1980s (rather worryingly, I did get some from the 1970s but seem to have lost these somewhere in the chaos that is my office) I find more things I want to write about, but this is one I've had brimming in my head for ages. For many pony mad girls, if you didn't have a pony, you had a model pony. Preferably lots. I was definitely in the lots camp, having a fine collection of Britains model horses, riders and stables. The big advantage to Britains was that they were cheap: my 5/- (25p) pocket money would buy one in the early 1970s and leave me some money over for sweets. 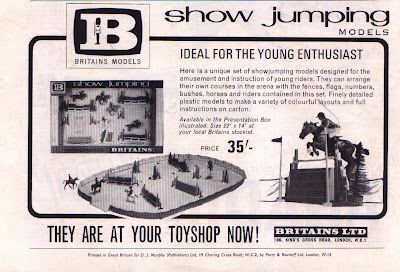 Here is the Britains showjumping set. I did actually have this, but I am utterly ashamed to admit that I lost nearly all of it over the years. Thanks to Susannah Forrest too for telling me about the plethora of Win a Pony competitions there have been. Newspapers did it: the Evening Standard, The Reveille, and the Sunday Express, besides Horse and Pony and Pony. I've found a mention of The Sun running one. Retail companies did it too. I would love to have seen the Milky Bar Shetland, and the Heinz Beans skewbald, the Kerry Gold Butter palomino, and the Sugar Puffs pony. Susannah also reminded me about the TV ad which W H Smith ran to publicise their competition in the 1970s. It showed a girl posting her form, only for a neigh to sound from the post box after she'd turned away. This does ring a bell, despite the fact that my sister and I were not supposed to watch ITV, which was the only source of TV ads in the 1970s. We used to watch it illicitly, one of us close to the telly just in case, ready to switch to virtuous BBC1, and the other with an ear cocked in case we heard Mama coming down the hall. Would you like a pony? Thanks to Susannah for sending me this. Oh life is so UNFAIR! A while back I interviewed Caroline Akrill about her books: acute observers will have spotted that there was a great gaping hole where the Silver Bridle series wasn’t. This was nothing to do with Caroline: it was all to do with the fact that I hadn’t read the books recently when I was thinking of what to ask, and so hoped to draw a veil over my ignorance by asking nothing. 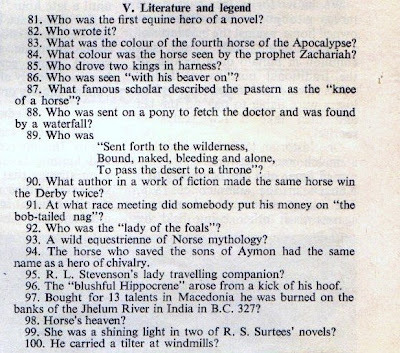 Anyway, I do still have a few bones of academic respectability about me, about which I hope my tutors would be proud, though I think they would perhaps goggle a bit to find out their former student now applied that rigour to the pony book. But I digress. This is a curiousity, and not the sort of thing that I tend to come across very often. Amélie Rives' Trix and Over-the-Moon is a very early American horse book, written in 1908. It's not a story told by a horse, like Black Beauty; what it is in fact is a horse story with what came to be a traditional plot: girl (or woman in this case) buys tricky horse; tries to school horse; aims at showing horse successfully.